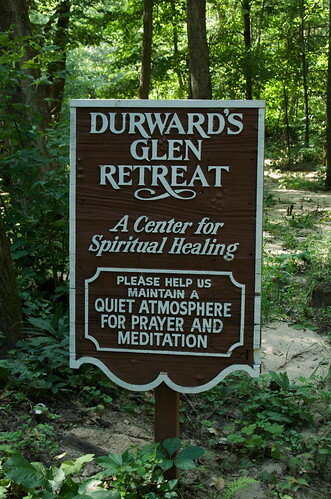 Durward's Glen, located in the Baraboo hills, is a retreat and education center owned by the Magdalen College. The site has been a family destination my entire life; a relatively close by place for a picnic. Getting there was half the fun because it meant taking the car across the Wisconsin River on the Col-Sac ferry. Yesterday I repeated the journey, as I do once or twice a year, on my motorcycle with the intent to take photographs. 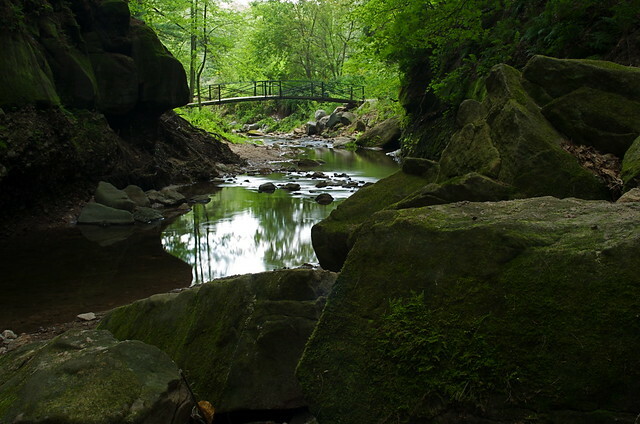 It is an interesting place much like nearby Parfrey's Glen (which is closed again due to flooding) and Pewit's Nest, a small slot canyon carved by a millennium of spring-fed stream flow. Like Parfrey's, Durward's Glen shows signs of the flooding that occurs and wreaks havoc on the valley. A side note: We've had 5 or 6 of these so-called 100-year floods in the past 15 years. Call it what you like, but our weather patterns are decidedly different than they have been for the prior hundred years. From the parking area, the walk up the stream is initially easy. Evidence of the recent flooding is abundant and the high-water mark is a bit alarming. Our family had contributed the funds to rebuild the bridge here after the ancient one was washed out about 15 years ago. "Our" bridge was destroyed only a few years later in a flood, and was replaced again. To my amazement, THAT bridge had also been washed away and there was another new bridge! That makes this the fourth bridge in 15 years. (It reminds me a bit of the tale of "Swamp Castle" in Monty Python and the Quest For the Holy Grail..."But the fourth one stayed!") 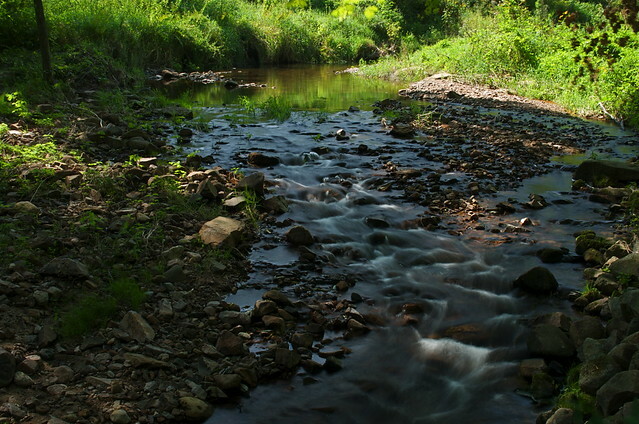 Here is a gentle view of the stream close to the parking area. The real magic of the place begins just upstream of the bridge. The glen narrows to a tight slot about 20 or 25 feet wide and perhaps 30 feet deep. The temperature drops as the moist rock shares its mini-climate. Springs feeding into the creek are everywhere. Your brain and body relax almost immediately. It is truly a place of tranquility. "We shall make our home on that shady slope, and I shall bridge the stream so our children may play in the valley. With the tranquility of solitude and the sweetness of growing life, we shall breathe the pure air of the hills, drink the fresh water of the stream, eat the fruits of the valley and rejoice in the presence of God." There are more images to see, presented in a SLIDE SHOW that better showcases their saturated yumminess. Enjoy!